1) Are the protests in Venezuela led by opposition parties on the right? - No. 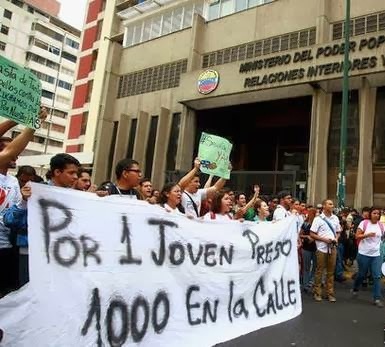 The current wave of protests began in the city of San Cristóbal (Tachira) on Feb. 4 when students denouncing security issues on the university campus were met with repression and several were jailed. The consequent protests focused on liberating the detained students, spread to other cities and were also met with repression, intensifying student unrest. It was in this context that a faction of the opposition launched a proposal for street demonstrations dubbed “La Salida” to demand President Maduro’s resignation, while another faction opposed the idea of street demonstrations focused on this larger, single demand. Despite the arrest of the conservative politician Leopoldo López, the widespread protests all over the country have overwhelmed and “surpassed on the left” the opposition political parties. 2) Are the protests in Venezuela part of a coup against Maduro’s government? - In Venezuela, a country with a history of military coups, there is always some possibility that events will take that turn. However, the current situation is very different from 2002 when Hugo Chavez was temporarily taken out of power by a coup. After that date, the armed forces were politically cleansed at high and middle ranks; those who filled the open positions were ideologically committed to the government and further secured by receiving a free charter to control various country businesses. The most likely source of a coup today in Venezuela is one Chavista faction or another. Their aim would be to ensure the country’s governability so that the military along with energy transnationals may continue to operate successfully in the country. 3) Are the protests connected to a “conspiracy” on the part of private media networks in Venezuela? In addition, print media suffers from a lack of paper due to the controls on foreign currency exchange imposed by the government. For this reason, protestors have taken responsibility for generating their own reports, making extensive use of social media networks. 4) Are the protests’ only aim to oust President Nicolás Maduro from power? - This is a movement without a center, and there are many demands. To sum them up, there are two agendas: one from Caracas and one from the cities in the interior of the country. From Caracas, the majority demands are the President’s resignation, the liberation of political prisoners, and the rejection of violence. From the other cities, which have suffered extremely for years from the interruption of public services and the scarcity of basic goods, the problems of soaring inflation, scarcity, and lack of water and electricity are also a central majority focus. 5) Are the protests limited only to the middle class? - In Caracas, the majority of protestors are middle class people and students from public and private universities. In the interior of the country, the situation is completely different and many in the popular sectors take an active part in the protests. 6) Are the images that have been circulating of repressive acts in Venezuela all false? - There are some who have maliciously or innocently spread images and videos that do not correspond to current events in Venezuela, but social media networks have proven to be very good at self-regulation and have successfully denounced these as false and educated users on how to verify information before sharing it. The government’s strategy has been to “attempt to show” that since 3, 4, or even 10 images are false, all the others are also. But the facts are there, recorded through the technological devices of dozens of witnesses of the government’s repression. 7) If it isn’t the political parties, then who’s organizing the protests in Venezuela? - In the end, the political parties have had to join in on the protests and have tried—up to now unsuccessfully—to channel them. For example, the Mesa de la Unidad Democrática (MUD) called for three days free of demonstrations after February 12 for mourning, and people disobeyed, continuing on the streets. Many launch initiatives through social media networks; some are picked up and go viral; others fall on deaf ears and are forgotten. 8) If Nicolás Maduro resigns, will Venezuela return to its past state of affairs before Chávez? - No. First, in the case that should happen, it is impossible to turn back the achievements regarding progressive rights established by the Constitution and internationally backed. Second, it is impossible that, as some believe, the “opposition”—whatever we understand that to mean—will oust “chavismo” from “power”—in the broadest meaning of that term. The Bolivarian movement has a broad base that, regardless of how the protests end up, will continue figuring centrally in Venezuelan politics in the near and not so near future. 9) What is happening with political repression in Venezuela now? - As of this date, there have been 11 deaths related to the demonstrations, the majority a direct result of repressive units. An estimated 400 people have been detained for participating in the protests. Just in Caracas, according to counts from the human rights center of the Catholic University DDHH, 197 have been released, 7 remain detained, 6 are disappeared or unaccounted for, 8 have been deprived of liberty by court sentence. 10) Who is repressing the protests in Venezuela? - Mainly the Bolivarian National Guard (GNB), the Bolivarian National Intelligence Service (SEBIN), and paramilitary groups indirectly funded and openly encouraged by the government. 11) What role does US imperialism play in Venezuela? - President Barack Obama and the State Department publicly condemned the restriction of democratic liberties in Venezuela. This led Nicolás Maduro and his followers to accuse them of meddling in the internal affairs of another country and violating Venezuela’s sovereignty. Despite insisting that the US is behind the protests, Maduro has also invited the North American government to reestablish diplomatic relations between the two countries. On the other hand, Chevron continues to have many productive business deals in Venezuelan territory in the areas of gas and oil exploitation through contracts signed by President Chávez that are good for another 30 or 40 years. The US continues to be Venezuela’s greatest “commercial ally.” Venezuela sends its largest quota of exported energy to the US and in turn imports many products from the US to address the country’s scarcity problems. Finally, Nicolás Maduro’s government revoked CNN’s working credentials, accusing the network of “violating Venezuelan laws,” only to renew them 24 hours later, inviting CNN to return to the country. The governments of other countries in the region have also expressed either support or concern regarding the situation in Venezuela. 12) What is the role of social movements in Venezuela at this juncture? - During the last 15 years social movements have suffered from a policy of active state intervention that has diminished and divided them and often resulted in their being coopted. Lamentably, the few groups that have persevered with some degree of autonomy—for example a few labor unions—are too weak to have any real impact on the current situation. I spoke with my good buddy, Barry O'Bama today. He told me that in the event that Maduro is kicked out of Venezuela, there is a job waiting for him in Washington, DC. It appears that the Washington, DC Metro system has a shortage of bus drivers! This sounds like wishful thinking. Does the author have any sources/citations to back some of these claims? I am especially interested in source material on claims made in FAQ's 1, 2, 8, and 11. Where/how are the authors of El Libertario getting the information for their demographic described in 1? For #2, is there more extensive analysis about how the armed forces were "cleansed," and that a future coup would be led by "one chavista faction or another"? Regarding #8, what is it about the Bolivarian Revolution that the authors think incapable of turning back? Why do they believe that its wide base makes it un-undermineable? And finally, for 11, why do the authors think that bilateral trade between Venezuela and the United States is significant? Do they believe that this proves that Maduro is carrying out the interests of US imperialism, by selling Americans cheap gas or importing US goods? Also, do the authors have more details regarding this Chevron involvement? Is Chevron being given cart-blanche to exploit Venezuelan workers, as it has done in other oil-rich countries? I think more importantly, do they believe that collaboration alone is enough for the US to consistently back a regime? Do they deny, for example(s), that the US supported and then turned on Saddam Hussein, Qaddafi, Mubarak, and other regimes when they became inconvenient or incompetent? More to the point, does Maduro's alleged collaboration mean that US imperialism would not still try to overthrow him? I know this is meant to be a quick explanation but for some fairly serious claims, I would expect better and more thorough analysis. Please let me know if the source material I asked for is available, in English or Spanish. You're unlikely to get a reply here as the article wasn't posted by the authors. To get hold of the information you're requesting you're probably best of contacting El Libertario directly. But, given you're only trying to get hold of information to discredit what they're saying, I doubt they'll respond. If they have source material, it will discredit what Maduro and other leftists are saying. Such an important battle, but it seems like it's difficult to get an accurate picture beyond "it's like this" "no it's like that" "rabble"
OK it's tempting to get sucked into a spiral of defending El Libertario's coverage of the protests, and Venezuela as a whole, wherever I see it, which I'm not keen to do, since I'm not associated with them at all (anymore) and I don't agree with them on a lot of things. In fact, I haven't read most of their output on Venezuela cos I've been travelling shitloads for work lately. Having said that, I think Drakula's posts on this thread are ridiculous, regardless of the topic at hand. This is a supposed to be a basic FAQ, a summary of El Libertario's coverage as a whole. Weighing it down with source material would detract from its concise nature. They have written plenty of material on the protests on their website (including a few articles in English), as well as maintaining a (currently digital only, due to the prohibitive printing costs brought on by the crisis in the country) newspaper, which has critiqued chavismo right from the start. If s/he really is interested in knowing their sources, I recommend going there. I think Jim's right though: this is basically a crude attempt to defend chavismo, rather than a diligent commitment to academic veracity. Where is Drakula on the threads about Ukraine, Bosnia, etc demanding the authors provide sources for generalisations? Now everyone please note that Drakula is a new user so please follow our posting guidelines and the nice, and don't automatically assume negative intent, thanks. Trotskyist Chavista collective, Marea Socialista (MS), has announced that it would be fielding its own candidates independent of the governing Unified Socialist Party of Venezuela (PSUV) in this year's upcoming parliamentary elections. MS leader Nicomar Evans stated that the group's decision was motivated by the "necessity of a critical and self-critical vision" towards the revolutionary process in which "critiques can be formulated and the course corrected". In this vein, he indicated that MS candidates must be committed to realizing "a public citizen's audit in order to detect fraudulent elements in the allotment of dollars," referring to widespread fraud among private firms, who pocket government-issued preferential dollars and change them on the booming black market, in lieu of importing essential items. Evans has long criticized government inaction in the face of massive import fraud, which has cost the country billions in public funds, calling for MS candidates to rejuvenate the revolutionary process with new ideas. Venezuelan police on June 10 raided the offices of the Trotskyist left-opposition organization Marea Socialista in Caracas on the orders of a local court. The raid was carried out by agents of the Scientific, Penal and Criminal Investigative Corps (CICPC), with a warrant to search the premises for "objects of criminal interest," including "counterfeit foreign currency," "firearms," "information storage units," and "documentation related to financial transactions." According to a press statement issued by Marea Socialista, the agents arrived at the offices heavily armed, offered no explanation for the search, and promptly departed a half-hour later after failing to find what they were looking for. The party's founder Nicmer Evans confirmed that following the raid the organization received two calls from the CICPC director, who "tried to justify that the cause for the raid was not related to MS." The statement called the incident a "grave violation of political liberties," and the latest in a series of "retaliations, threats, violations of privacy, firings, and limitations of social and political rights" that the party's members have suffered in the "last three years" and especially in the "last six months." Marea Socialista has emerged as one of the most vocal leftist critics of the Maduro government, charging that high-level corruption has corroded the revolutionary process. Last year, the self-identified "critical" Chavista organization broke with the ruling United Socialist Party (PSUV) and filed for independent party status in order to field its own candidates in December's parliamentary elections, in which the ruling party lost its majority. The request was denied by the National Electoral Council (CNE) on the grounds of the alleged unviability of the organization's name. The day after the raid, Venezuela's Supreme Court agreed to hear a challenge by Marea Socialista, demanding a reversal of the electoral body's decision.